What Prospecting Tools are You Using? If you expect to be successful by just using email to prospect or any other single method, you’re in for a rude shock. To be successful reaching prospects, you have to use every tool available. This is why a lot of salespeople fail when they think all they need is social media. It will reach some people, but it will never reach enough people to be successful. Think of a plumber you call to your house. Do you want them showing up with a single tool or a big tool box of tools? You want them to have a big tool box full of tools to allow them to fix your problem. The same goes with prospecting. To be successful, you need to use email, phone, social media and any other means necessary to reach prospects. Salespeople make the mistake of thinking the way they want to be communicated to is the way the prospect does as well. No. Prospecting starts with reaching the prospect the way that is most effective for them. No single tool should represent more than 30% of your total communication process. If it exceeds that number, you’re falling short in being able to reach all the prospects you know need what you have to offer. 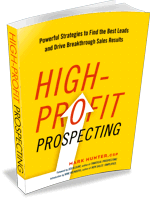 Check out my new book, High-Profit Prospecting. For the month of June, Amazon has the Kindle version on sale for only $2.99! Grab it today and don’t forget to leave a review on Amazon.